When Bainbridge Island author Jonathan Evison visited Whatcom County in 2017 as part of the Whatcom READS program, we met a gregarious, intelligent, self-destructive and endearing writer who loves to talk about books and drink beer—a lot of beer. He presents himself as a bit of a sad sack, an Everyman, but there’s a certain twinkle in his eye and twitch to his lip that indicates his brain is going a mile a minute and he’s got a lot to say, much like the lead character in his latest novel, Lawn Boy. Mike Muñoz is just scraping by, grinding out one crappy landscaping gig after another. Topiary is his passion, but for now “the man” is keeping him down (or maybe it’s that he’s his own worst enemy?). When he’s not sweating at work, Mike’s taking care of Nate, his developmentally disabled adult brother with a major attitude. Nate’s nothing short of a tyrant, and while Mike loves him fiercely, Nate can be a little much. Nate’s addicted to Oreos and has watched Despicable Me dozens of times. Mike is clearly lonely, but his limited income doesn’t leave much cash flow for impressing the ladies. Mostly he lurks around Mitzel’s hoping to catch a glimpse of the waitress he thinks he has a crush on. When Mike loses his latest job after refusing to pick up a client’s dog poop, it’s time to kick his plan for self-improvement into gear and head to the public library. Though the small but daily disasters continue to pile up, the library’s got AC, plenty of self-help books and a lovable librarian named Andrew to help Mike discover his authentic self. It’s rare to read a novel that is both compassionate about the plight of the working class and unsparingly honest. Evison can find moments of beauty and humanity among the strip malls and trailer parks. Through Mike, he explores what it’s like to grow up biracial, broke and fatherless. As Mike careens from one warped father figure to another, trying to achieve his dreams and understand his ethnic and sexual identities, we laugh, wince, cry and shake our heads along with him. Evison can be vulgar and blunt, but his characters are sweet at heart and vulnerable. 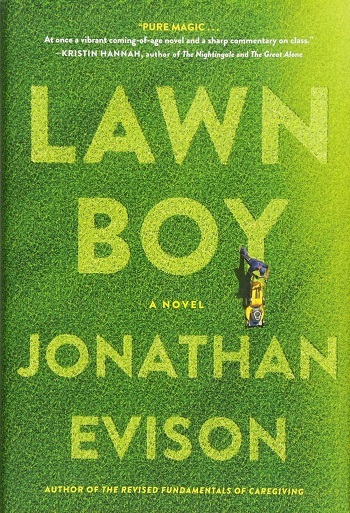 Whatcom County Library System and its partner, Bellingham Public Library, have plenty of copies of Lawn Boy at the ready for checkout at libraries around the area (with eBook and various audiobook formats on order). Take a break from mowing and weeding and borrow a library copy today!